Sitting on the stoop of my mother’s 3-bedroom garden apartment in Queens, I watch over my 4-year-old son playing in the courtyard. It’s a familiar, comforting spot. Many members of my partner and I’s extended family live here, in the same small, tight-knit community that I grew up in. Now I’m raising my family here too. This intergenerational community would never have been possible if we didn’t have access to affordable housing. For us, it takes the form of rent-stabilized apartments. But many other New Yorkers are not, or are no longer, so lucky. There are only about 1 million units of rent-stabilized housing left in New York City, a 20 percent decrease since 1981. Rent stabilization, a law that provides for annual caps on the rent hikes landlords can impose, is one of the best regulations we have for maintaining true affordability. So it is no surprise that as rent-stabilized units are vacated, landlords swoop in to move them into deregulated, market-rate status. The law itself has been under attack for decades and continues to be eroded by lawmakers and developers looking to reap high profits in “desirable” neighborhoods. Low- and middle-income families across the entire city are facing major difficulties in finding homes they can afford and staying in them. Over the last decade, the increase in rent costs has been double that of wages. Simultaneously, even with decent inclusionary zoning practices — rules that mandate that any new development or rehab include a percentage of affordable units — these families are being closed out of the vast majority of new housing being built in the five boroughs. “Affordability” is defined using a calculation of Area Median Income (AMI), and that takes huge swaths of a region into account — lumping millionaires, middle-class families and the working poor together. In a city with one of the highest wealth disparities in the nation, “affordable” homes are effectively out of reach for low-income and extremely low-income New Yorkers. In addition, even those who can “afford” to remain — often, by just scraping by — have to prepare for living in a drastically overhauled neighborhood. Such a neighborhood is one in which affordable food, schools, health care and other services are no longer available because the local economy has shifted to meet the desires and needs of a new, wealthier demographic. This is the full picture of gentrification. The situation is not unique to New York. We are in the midst of a national housing affordability crisis the likes of which this country has never known. According to the Center for American Progress’ 2012 report, The Housing Market is Not Only for Homeowners, nationally, rents climbed 4 percent in 2012 alone and another 4.6 percent in 2013 — and are expected to increase by at least 4 percent per year in 2014 and 2015. Meanwhile, real median renter incomes fell over much of the beginning of the century, ending 13 percent lower in 2012 than in 2000. Harvard’s Joint Center for Housing Studies’ 2013 report, America’s Rental Housing: Evolving Markets and Needs, revealed that almost half of renters, 46 percent, earn below $30,000 annually, including 22 percent whose income is below $15,000 — roughly equivalent to working year-round at the minimum wage. The foreclosure crisis has driven millions of former homeowners into the rental market. And recent reports of a housing market rebound are misleading: Nationally, economic and social costs for most renter households are increasing and are expected to worsen in coming years. For low-income renters in particular, chronic housing insecurity has reached disastrous proportions, exacerbated by weak federal, state and local protections for renters, immense tax breaks for developers that undercut revenue generation for cities and states and the entrance of the corporate landlord. The most recent growth of, corporate landlord holdings has been driven by private equity firms, and chances are that they’re run by the same actors who crashed the economy the last time around. 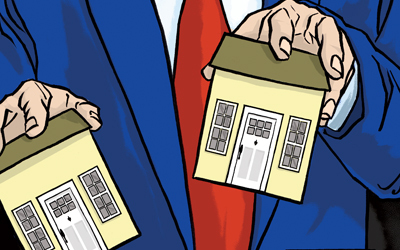 These firms are buying up single-family foreclosures and non-performing loans across the country, properties that Fannie Mae, Freddie Mac, the Department of Housing and Urban Development (HUD) and the Federal Housing Authority (FHA) are eager to get off their hands. They are then converting them to rental properties and charging rents that often times exceed even local market rates. Taking advantage of weak renter protections, these firms are gobbling up housing stock — they’ve gained hundreds of thousands of units over the last 2 years — and offering rentals that are poorly rehabbed, suffer from pest problems and are inaccessible to those formerly incarcerated or low-income families. In the meantime, they wait for the values of these homes to rise, so they can evict their tenants and move the properties back into the market for purchase. It is presumed that these “bad actors” are hoping that their business will continue to grow rapidly and without much public scrutiny. The growing threat to accessible stable housing will only be curbed by robust renter organizing around the country, and tenants and local housing groups are stepping up and calling attention to the issues on the ground. In New York City, groups like the Brooklyn-based Crown Heights Tenants Union and the newer Queens-based Ridgewood Tenants Union are organizing tenants to join with other decades-old community groups in a fight to ensure that Mayor Bill de Blasio’s plans for housing create quality and affordability for the city’s most vulnerable communities. In Boston, foreclosure, tenant and environmental groups like City Life/Vida Urbana (CLVU), Chinese Progressive Association (CPA) and Alternatives for Community and Environment (ACE) have joined forces to combat developers who are driving rent and home prices through the roof. In Los Angeles, longtime housing groups and community developers like Strategic Actions for a Just Economy (SAJE) and East Los Angeles Community Corporation are engaging congressional representatives to take on corporate landlords and keep community wealth where it belongs. And in Rhode Island, a local coalition of tenants and homeowners led by Direct Action for Rights and Equality (DARE) have just won a statewide ordinance around just-cause evictions. In terms of policy, ensuring decent housing as a right rather than as a commodity represents the best path forward for long-term community stability and broad-based prosperity. All levels of government must recognize and protect this right and, concretely, prioritize the provision of decent housing for those most in need. How can we achieve this? Tenants, organizers and lawmakers must assert the concept of housing security more regularly. Housing security is not simply a reflection of affordability, which is generally the primary consideration that drives current debates. Instead, it recognizes that decent housing involves paying attention to a number of interrelated concerns. In brief, these are affordability; accessibility; long-term stability and protection from displacement; health, sustainability and quality; and community control. Taken together, these five pillars comprise a model that meaningfully engages with the interests of those for whom housing insecurity has been, or may become, a fact of life. If we uphold these principles as tenants, organizers and lawmakers, then we have the chance to foster healthy communities in permanently affordable housing and break the unacceptable pattern of failure that has defined this country’s investment (or lack thereof) in housing for decades. Nothing can replace traditional community organizing as the vehicle to achieve this, and now, more than ever, is the time to invest in organizing that works to reclaim, remain in and rebuild our communities. Rachel LaForest is the executive director of the Right to the City Alliance. For more, see homesforall.org.